Apples are available in supermarkets year round, but in the fall fine, locally grown apple varieties appear in produce sections and at farmers markets. Apple fritters have been delighting people of all ages for a long time -- for breakfast, for brunch or as a delicious treat any time. In this recipe, we describe two methods for preparing this old-fashioned goodie. The above photo illustrates the first method. Peel, core and finely chop the apples. Cover with plastic wrap and set aside while you make the batter. Combine the flour, salt, baking powder and sugar in a medium mixing bowl. In a separate bowl, stir together the eggs, milk, oil and vanilla. Add egg mixture to dry ingredients and stir well. Fold the chopped apples into the batter. Heat 3 or 4 inches of cooking oil to a temperature of 375°F in a dutch oven, large saucepan or skillet. Drop apple batter by tablespoonfuls into the hot oil and fry about 3 minutes or until golden. Remove from oil with a slotted spoon or spatula and drain on paper towels. 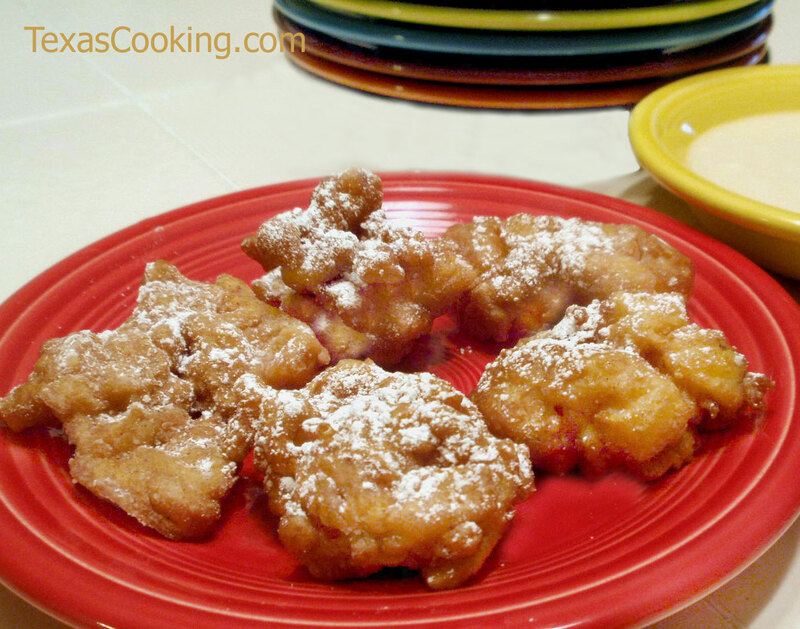 Serve with Apple Fritter Glaze (recipe below) or sprinkled with confectioners' sugar. Makes about a dozen fritters. The alternative method involves coring and peeling the apples, then slicing each apple into 8 wedges. Makes 32 small apple fritters. Combine confectioners' sugar, salt, milk, vanilla and melted butter, and mix well.